Woe betides the coffee snob who cannot distinguish between a caffe latte and a café au lait. Imagine the shame of confusing Kalossi with Kona, or Celebes with your humble Columbian. Even the well-informed may not know that Mocha is a generic term for several aristocratic Yemeni coffees, not just a coffee house cocktail. Before taking a friend’s two teenage daughters to school, I stop at Coffee Heaven where the girls order a Quad Kahlua Kicker: two double shots of espresso with vanilla, Irish cream, and steamed milk sprinkled with chocolate. Other coffee drinks are just as exotic. There is the 911: espresso topped with house coffee. The Redneck Latte: house coffee with two sugars, whipped cream, and chocolate sprinkles. How about an 000: decaf skinny Latte. New Age Rice Dream Mocha: non-dairy brown rice beverage with powdered chocolate and a single or double espresso. Mocha is an old port in Yemen . In the sixteenth century, exports from Mocha included fruits, cloth, spices, dyes, pottery, and most importantly, coffee, grown in the Yemeni mountains – the latest craze in Europe . Soon after the English and Dutch built the first coffee factory in Mocha, other Europeans followed and even some Americans. During that time Yemen had a world monopoly on coffee beans and the country prospered. Eventually, however, the plant was smuggled out of the country to Ceylon ( Sri Lanka ) and Java, hence, Mocha-Java. Another story tells of the Portuguese seaman who anchored off the shores of Mocha where the local Sheik greeted them with an invigorating and stimulating effect of the drink. They requested sacks of the green beans to take home and thus, the story goes, the monopoly was finally broken as the coffee bean started to grow in other parts of the world. When the original Mocha bean was transplanted, it mutated, adapted, became bastardized, and so only resembles the delicate grandeur of the original. "Jamaican Blue Mountain has the name, but we in Yemen have the flavor,” says Mr. Kaid, owner of the only coffee factory in all of Yemen . The home of the original coffee bean is waiting to be rediscovered. Yemen is one of the world’s oldest inhabited regions. Here the Queen of Sheba started her long journey across the Arabian Peninsula to meet King Solomon in the north. Early explorers such as Marco Polo visited Yemen , known then as “Arabia Felix,” where frankincense, myrrh, and Mocha coffee brought worldwide fame to Yemen . Legend has it that after consuming quantities of this brew, Marco Polo sped off to discover spaghetti. 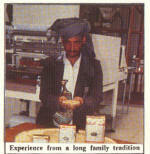 The Yemeni coffee boom reached its climax at the beginning of the 18th century. Prices had risen so much that the European powers were now trying to contravene the export embargo on the coffee plant and grow coffee in their own colonies. The Dutch succeeded first, around 1720 in Java, followed by the French in the West Indies . Later a number of other coffee growing countries started to grow the Mocha-derived coffee beans much more cheaply and in larger quantities. By the middle of the 19th century, Yemen supplied only 1 percent of the world coffee production. Since then Yemen ’s chief agricultural product has been quat, which has replaced some of the income lost from their dying coffee industry. This evergreen (Catha edulis and Catha spinosa) is cultivated for its shoots and chewed as a stimulant. It is grown interspersed with coffee trees in plantations. The restoration of the coffee trade is on many Yemeni’s minds. They want to see the mocha coffee plants fill the mountains once more and get rid of what some call “Satan’s green leaves.” This is exactly what Mr. Kaid and his families are doing. Their coffee beans come from the fertile terraces of the Western Yemeni mountains, which reach elevations of more than 9.000 feet. As in the past, the best coffee is grown there on rain-fed terraces. The method of cultivating is still the same as it was 300 years ago. The soil is prepared by hand, and each tree is taken care of individually using stone mulch. “Our family has a long-standing tradition in selecting and treating coffee beans. We combine traditional methods with modern machinery. This is our family’s secret and why the aroma of our coffee beans is outstanding among all coffee brands,” says Mr. Kaid. Today their coffee is exported to France , Germany , and Italy . “What about America ?” I asked. “ America ? Americans are not familiar with our coffee; they don’t even know that my country exists. Americans run around all day with a gigantic Styrofoam cup filled with sludge,” he sneered. “Haven’t you heard of the New Age Dream Mocha?” I responded. To the world’s first coffee drinkers, the Middle Eastern Muslims, coffee was the “Wine of the Apollo.” It was their counterpart to the pagan wine of Dionysus, and ecstasy. Today’s Western coffee connoisseurs critique an excellent coffee with the same exactitude as a vintage wine. And what is the best coffee? According to the Kobos Coffee Company, the most exotic coffees are Jamaican Blue Mountain , Kona, and Yemeni. How is the Yemeni coffee selling? “It sells very slowly; most people have never heard of it,” said David, from Coffee Corner Limited. “Absolutely! We carry coffee beans from all over the world,” Matt answered. “Do you have Yemeni coffee beans?” I’ve never heard of them,” he responded. “What is the most exotic coffee you carry?” I continued. Is this the wave of the future? Will coffee information become the new currency of international espionage? Americans, whose revolutionary history is founded on an argument about tea, might be expected to wax passionate on the subtleties of the mighty Mocha.